So at this point in my Sunday in the Park cocktails I realized I was getting to the end of my friendly oranges and yellows and I hadn’t yet used a nice aged whiskey. I had utilized a silver whiskey for my first drink, the Vermillion, but hadn’t gone with a whiskey with any color, which I knew wouldn’t be possible once I moved into blues and greens. 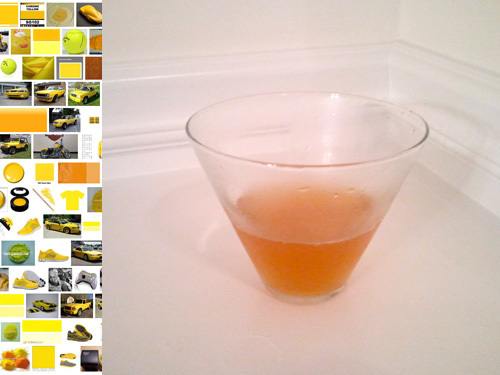 So I turned to bourbon for the basis of my sour variation, the Chrome Yellow (let’s say something like #FCDE28 though I was going for more of something you would see on a school bus). Twist lemon peel over glass and discard. I am not the biggest fan of lemon juice, as I have written, but there was enough sweetness here to counter it for me. The Gran Classico added a bitterness to the sweetness from the floral St. Germain (in addition to its own sweetness and what you get from the bourbon). It also added just the right color, which, you know, is sort of the theme here. Interestingly to me, chrome yellow was an unfortunate choice for Seurat (and others). It oxidizes and dulls over time and a fair bit of brilliance in the original La Grande Jatte painting is gone because of it, replaced by muddier browns where the more vibrant chrome yellow once was. That’s a lesson to everyone to fresh squeeze their lemons for their drinks. I think. I’m not good at extracting morals.